Having the right tool for the job is important, especially if you are gone split a few cubes of wood for the upcoming winter. 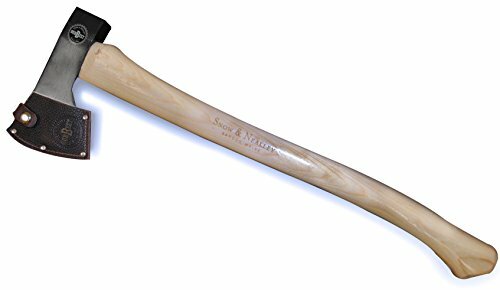 So to help you out I compiled a list of the 6 best splitting axe money can buy these days. Please share your experience or let me know if I missed one the great axes. Before we go to the best splitting axe, we start comparing the different axes. There are a few details you should keep in mind. Most people tend to buy a long handle, 36 inches or so because this allows you to swing with more force. The problem with a longer handle is that you tend to lose control, you will have more difficulty hitting the wood at the right place. A shorter axe is therefore recommended, with a length around the 28″. This is the ideal length for the average man. Having this sad, the most popular and most bought axe available is a 36-inch axe, the Fiskars x27. I have to say this is the best splitting axe available. I bought it two years ago and I still love it, some people are not a fan of a fibre compound handle, but it never let me down. Another tip I like to share with you, the best slitting axe is not the heaviest axe. If you are just starting with splitting wood, then don’t go for a to heavy axe. Yes, a heavier splitting axe will give you more force, but you will lose accuracy over it. So start with the lighter splitting axe and if you gain more experience over time, then you can increase the weight. I have compared the most popular wood splitting axe with a length around the 28 inch. At the end of the article, you will find a table with all products with all the important details in one overview. 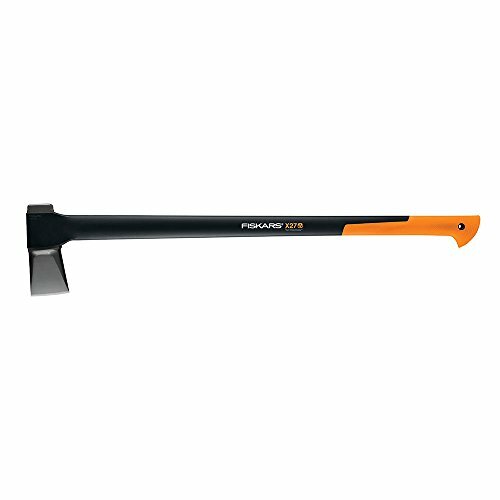 The Fiskars X27 is longer than recommended, but this is the most popular wood splitting axe available. With a length of 36 inches, it’s actually too big if you just start chopping your wood. But it’s a beast of an axe. The Fiskars X series is one of the most popular series and for a good reason. They have perfect length weight balance, a nice shock absorbing handle and most import, lifetime warranty. Some people prefer a wooden handle over a fibre one, but keep in mind that the FiberComp handle is stronger than steel! So you don’t have to worry that it will break when you overshot and hit the wood. The Fiskars is razor sharp and has a perfect wedge design. Splitting wood with the Fiskars will save you time, effort and cause less strain on your hands! A more traditional splitting axe with a Hickory handle. It has a perfect weight and it has a good feel in your hands. It’s not an axe to split great amounts of wood, but more a daily use axe to split some wood, clear your path or take long while hiking. The handle has a perfect aligned grain and the axe is pretty cheap. The only part missing is the sheath, you will have to buy this separately. The only all steal axe in the review. This American made axe of forced steel will give you maximum strength and durability. The patented shock reduction grip reduces the impact vibration up to 70%. With the black design, it not only splits well but also looks good! It arrives sharp and ready to use. This is not your axe for big trees, the head tends to get stuck when swung too hard. But it’s perfect for smaller trucks (2 – 6″). The most expensive one in the list, but well worth it. Like the Fiskars, it has a perfect weight distribution and a fibre handle. The head has a perfect geometry for an easy entry into the wood. It also comes with hammer function and shaft protection. The head is working sharp when you receive it, so you can use it straight away. Made in the land of the gods, Sweden. A traditional style multi-purpose axe. The head is attached to a hickory shaft. With the 26 inch length, it’s perfect to use with two hands or one hand if you have a strong grip. 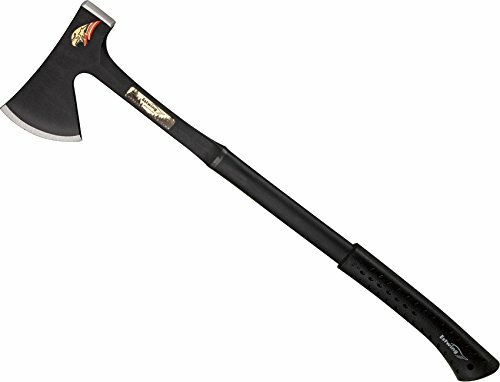 This is a real multi-purpose axe to use around the home. You receive the axe sharp and ready to use. The wooden handle has a perfect grip and it not coated. A good quality axe with a nice Hickory handle and head made from fine grain steel. The wooden steal lays perfect in your hand and the axe is balanced very well. The blade is not very sharp when you receive it, so you will have to do some sharping when you receive it. It comes with a nice leather sheath and is made in the USA. I have put the 6 best axes for splitting wood in a table so you can compare the main features in one overview. As mentioned earlier, if you have the experience, then the best splitting axe is the Fiskar X27 in my opinion.